My wife Jenny and I have been using the Bedtime Prayer that John Eldredge wrote for Walking with God as part of our bedtime routine. As much as I have enjoyed the prayer I thought it was time for a prayer that was better suited to pray together. 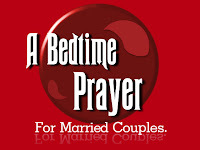 Hopefully this will encourage you to implement prayer into your bedtime routine. Our Father in Heaven, we pause at the end of this day to say thank You. We give You thanks for the blessing of life, for the blessing of each other, for the blessing of family, and for the blessing of a home. You have richly blessed our lives. Restore us Father to Your Son Jesus. He is the vine and we are the branches and He has become our source of life. Open our hearts to receive the Holy Spirit's guidance, healing, and transformation. May our lives and our marriage bear the fruit of the Spirit. We surrender our lives and our marriage to You. You have our bodies, possessions, and spirits; we give You our hearts, souls, minds, and strength. We belong to You. Lord God, sanctify our house and make it a home. We ask that Your Kingdom will come into our home so that this house will become a refuge from the world; filled with love, peace, joy, and hope for all who enter. Give us the wisdom to be good stewards of what You have blessed us with, and help us use these wonderful blessings to build Your Kingdom. Blessed Father, if there are any issues that build up walls of separation between us, make us aware of them. Our desire is to handle these issues and to surrender them to You so we can prevent Satan from having a stronghold in our hearts and in our marriage. Give us the courage to make the first move, to receive each other in love, to be forgiving, to be patient, to be kind, and to be committed to each other regardless of the issue. Move us to prayer for each other, to support each other, and to encourage each other every day. We ask for a shield of protection this night as we sleep. Send Your angels to war on our behalf and to keep evil from entering our home. Fill our minds and imaginations with sweet dreams and help us to fall into a deep and restful sleep, secure in the knowledge that You are watching over us. Thank You Father for Your grace, love, and forgiveness. Into Your hands we place our marriage and our lives. Guide us to the place You want us to be. It is in the powerful name of Jesus Christ, our Lord and Savior, that we pray, amen. Visit Paul's new blog at www.paulsponderings.com. Paul's Simple Prayer for Married Couples. 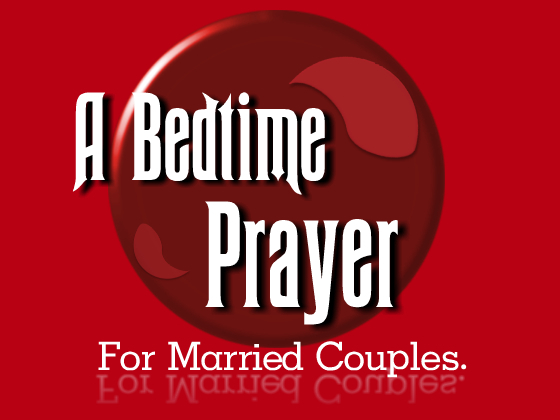 The Bedtime Prayer revised: Bedtime Prayer for Married Couples 2.0.